Ellen is a composer, piano teacher, organist, teacher and accompanist. As an Arkansas Artist in Education she works state-wide with students, teachers and community organizations. She is an active writer of numerous choral, keyboard and Boomwhackers Tubes publications. Music study at Fort Hays State University and the University of Kansas laid a firm foundation for her chosen lifelong career as an educator and musician. Following the successful recording project of “Winterwood: Finding Your Way Home” is the release of “Light Reflected.” Described as the style “jazzical with a New Age twist” is an all original collection of piano driven pieces with orchestration. Her piano pieces are National Federation of Music Club selections and “Cold and Fugue Season” received the distinction of J.W. Pepper’s Choice Award in choral music. Her published keyboard, choral and instrumental works have been performed internationally. 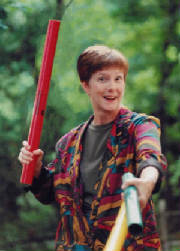 As Director of Education at Whacky Music, Inc. in Sedona, AZ, she developed a curriculum for Boomwhackers Percussion Tubes. After teaching years in Greensburg, Kansas, working at Whacky Music in Sedona, Arizona and teaching in the Washington D.C. area, Ellen is now actively involved in the music and artistic life surrounding the historic community of Eureka Springs, AR.